Members of the Order Homoptera, are distinguished by piercing mouthparts arising from the back rather than the front of their heads. Homopteran cicadas are among the loudest animals in the world and shellac is produced by scale insects. They look dangerous but don't bite or sting. They feed off the roots of trees before emerging at adults. Some of the worlds most beautiful art is on the wings of insects. 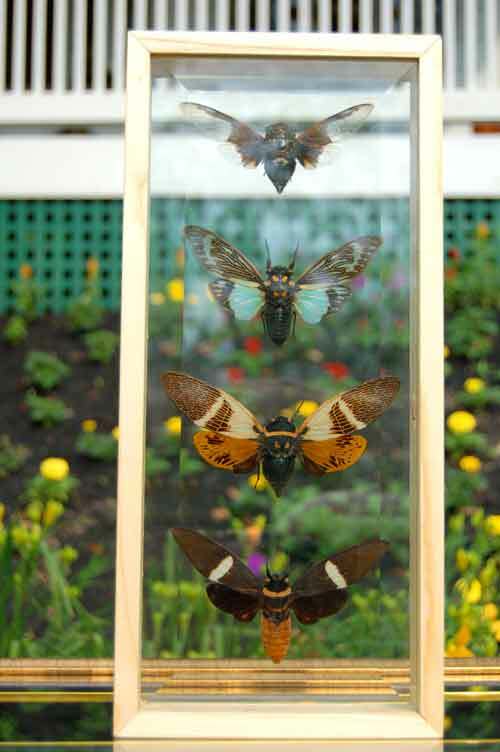 You will be mesmerized by the colorful complexity of these giant Cicadas. The balance and symmetry is the goal of any aspiring artist or architect. This beautiful display is 14.5" tall x 6.75" wide and 1.75" thick. We mount using two pieces of glass because the front is as beautiful as the back. We also use the latest mounting technique that eliminates all smells associated with mothballs. This is important because displays using mothballs inside the frame have a strong odor. The use of beveled glass adds to the beauty of this display. It can sit on a shelf or be hung on the wall. This is a very high quality display.